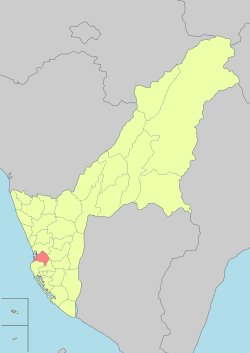 Zuoying District (Chinese: 左營區; pinyin: Zuǒyíng Qū; Wade–Giles: Tso3-ying2 Ch'ü1; Pe̍h-ōe-jī: Chó-iâⁿ-khu) is a district of Kaohsiung City in southern Taiwan. Zuoying District has the most populous village in Taiwan: Fushan Village. Zuoying was established in the mid-seventeenth century as a military fortress, known as Old Fengshan (鳳山, also Old Fongshan). It is now the site of Tsoying Harbour, known formerly as Port Saei (左營港). 'Sa-ei' is the Japanese On'yomi (Chinese reading) of the city's name in Chinese characters, but was romanized as 'Tsoying' after World War II by American Naval Consultants. Zuoying's Lotus Lake is one of the major tourist attractions of southern Taiwan. This beautiful man-made lake is situated between Gueishan (Turtle Mountain) and Panpingshan (Half-screen Mountain). The Spring and Autumn Pavilions, Dragon and Tiger Pagodas, and Confucius Temple dot its shoreline. The Confucius Temple is the largest Confucius temple in Taiwan. The historic gates of the Old Fengshan city wall are also nearby. There is a mountain called Shoushan or Chaishan (referred to as Monkey Mountain by many English-speakers), with a large population of Formosan macaques and many tropical plants, and part of which lies within the restricted area of the naval base. 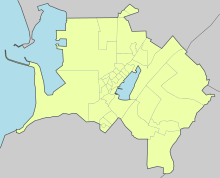 The district consists of Jinxue, Weixi, Dingbei, Zhongbei, Zhongnan, Miaotung, Miaobei, Weinan, Weibei, Bingshan, Xianghe, Yongqing, Juguang, Guanghui, Gequn, Mingjian, Dingxi, Shenghou, Shengxi, Shengnan, Chengnan, Lutung, Bubei, Bunan, Beixi, Beibei, Beitung, Haisheng, Chongshi, Zizhu, Guomao, Guohui, Guofeng, Xinxia, Xinshang, Xinzhong, Xinguang, Caigong and Fushan Village. 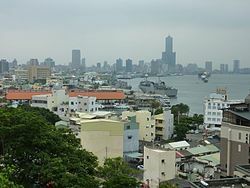 Zuoying hosts the Zuoying Naval Airfield (22°42′16″N, 120°16′48″E) and the Republic of China Navy's Zuoying Naval Yard, Taiwan's largest naval base. Villages near the naval base are composed of single-story houses, uncommon in most Taiwanese cities. The villages were first populated by soldiers of the Kuomintang who came from different provinces of mainland China and gathered here after losing the Chinese Civil War in 1949. The ROC National Government provided these veteran serviceman with these single-story houses. These residential areas belonged to the navy and were under military control at that time. Therefore, people outside could not enter villages without martial permission. Without interference from outside, the culture of villages embodies that of different provinces of mainland China. 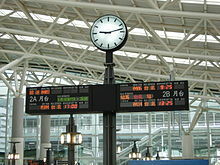 There are two stops on the West Coast Line of the Taiwan Railways Administration that serve Zuoying District: Zuoying–Jiucheng Station and Zuoying Station. The Taiwan High Speed Rail (THSR) serves the Kaohsiung metropolitan area with its Zuoying Station, currently the line terminal and a joint station with TRA's New Zuoying Station. ^ "Glossary of Names for Admin Divisions" (PDF). placesearch.moi.gov.tw. Ministry of Interior of the ROC. Retrieved 12 June 2015. Wikimedia Commons has media related to Zuoying District, Kaohsiung.